Each year, Cinetopia Film Festival brings the community together to experience the best films from the world’s best film festivals. As part of this, we are always looking to welcome new and returning program partners to enhance and expand our festival experience. This year, we are pleased to announce a new partnership with the Ann Arbor Jewish Film Festival, which will take place during Cinetopia. The AAJFF is a program of the Jewish Community Center of Greater Ann Arbor, and we’re excited to partner with them for the first time, a collaboration that we are sure will boost both festivals. We are sharing our Michigan Theater venue with the AAJFF and will be creating a special pass for their festival, one that also gives access to all films at Cinetopia. The AAJFF will be screening 10 films, two a day from May 12-16, 2019 at the Michigan Theater. 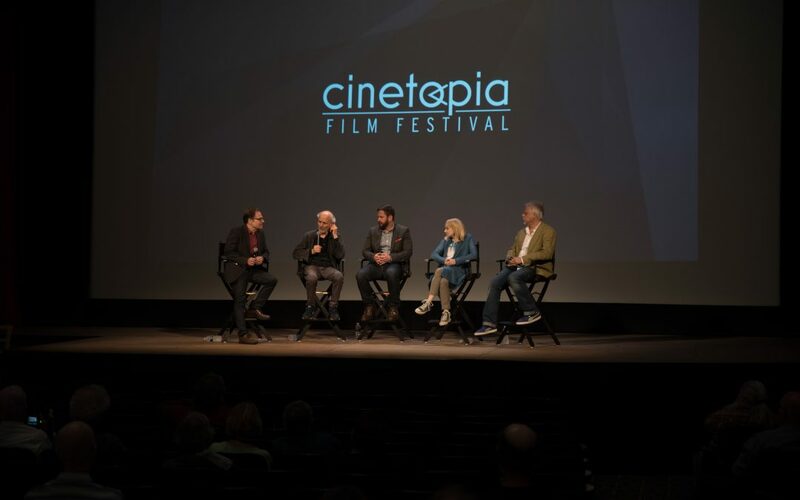 The AAJFF pass will cover both the Ann Arbor Jewish Film Festival and all movies during Cinetopia, with part of the proceeds going to benefit the Jewish Community Center of Greater Ann Arbor. Early bird pricing for the pass ($150) runs through April 12th via the AAJFF, and includes entry to the exclusive AAJFF sponsor dinner. After early bird pricing ends on April 12th passes will be available via cinetopiafestival.org, starting at $180. As part of the AAJFF, the Michigan Theater will host a special screening event on May 14 at 7:30pm. We’ll be showing the silent film The Ancient Law, a gem of German-Jewish cinema, with an original live score by the extraordinary violinist Alicia Svigals (who accompanied The Yellow Ticket at the Michigan Theater in 2018) and acclaimed pianist Donald Sosin. Tickets will go on sale on April 10th for members of the Michigan Theater and partner organizations (non-member tickets will go on sale April 12th). Returning to Cinetopia this year is our partnership with the Arab Film Festival, part of our ongoing collaboration with the Arab American National Museum in Dearborn. Although the AFF will take place June 7-16 this year, we’re excited to be hosting a screening of Dayla’s Other Country, followed by an Iftar dinner, at the Arab American National Museum on Saturday, May 11th, 2019. Dalya’s Other Country tells the nuanced story of members of a family displaced by the Syrian conflict who are remaking themselves after the parents separate. Effervescent teen Dalya goes to Catholic high school and her mother, Rudayna, enrolls in college as they both walk the line between their Muslim values and the new world in which they find themselves. Even though our festivals aren’t at the same time this year, we remain committed to our relationship with the AANM, and will show select films from the Arab Film Festival at the State Theatre during their festival dates. Another returning event at this year’s Cinetopia will be the University of Michigan’s Department of Screen Arts and Culture’s annual Symposium. The U-M Library is home to extensive archives and materials documenting the careers of several unconventional American filmmakers: Robert Altman, Ira Deutchman, Alan Rudolph, John Sayles, and Orson Welles. Together they make U-M a major destination for research on these American maverick filmmakers. “These are independent thinkers and artists, not traditional filmmakers consistently supported by the studios,” says Philip Hallman, the film studies librarian at the U-M Library. “They are all American mavericks with much to teach us not only about film but about our shared heritage, culture and society.” Last year’s Symposium honored Alan Rudolph, and this year’s featured artist will be Nancy Savoca, who will be in attendance. A graduate of NYU’s noted Tisch School of the Arts, Nancy Savoca hit it out of the ballpark when her film True Love took the top prize at the Sundance Film Festival in 1989. Together with husband and producing/writing partner Rich Guay, Nancy’s work foregrounds the female perspective and explores topics like unrequited love (Dogfight), three-generations of Italian-American women (Household Saints), abortion (If These Walls Could Talk), working mothers (The 24 Hour Woman), Latina lesbians (Reno: Rebel Without a Pause), illegal immigrant maids (Dirt) and estranged sisters (Union Square). The Symposium will take place May 10th through May 12th during Cinetopia, with three films and Q&A at the Michigan Theater. Advance prices for passes go through April 12th, and tickets will go on sale for individual films starting April 9th for members and April 12th for non-members. Buy your pass today!